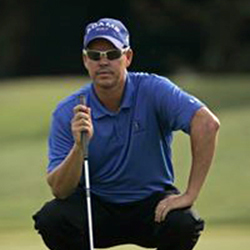 Brad Ott joined the Nationwide Tour in 1996. In his rookie season he recorded three top-10 finishes including a runner-up finish. He then took a hiatus from the Tour and rejoined in 2002. In his return to the Tour he recorded two top-10 finished and a runner-up finish. He picked up his first win on Tour in 2004 at the Price Cutter Charity Championship. He played on the Nationwide Tour until 2008. Ott played on the Sunshine Tour in 1995 and 1996 and won the 1995 Holland Insurance Royal Swazi Sun Classic. He has won tournaments on the Hooters Tour, Tight Lies Tour, Golden Bear Tour, Teardrop Tour, Ironman Tour, Mid-Atlantic Tour and Maverick Tour. After Ott's touring career ended, he became a club professional. He earned entry into the 2016 PGA Championship through his finish at the PGA Professional National Championship.